The Federal Capital Territory, Abuja Command of the Police, on Monday asked the FCT High Court in Jabi to dismiss the objection filed by Maryam Sanda and her three co-defendants, challenging competence of the murder charges instituted against them in respect of the death of her husband, Bilyamin Bello. Sanda allegedly stabbed the deceased, who was said to be a son of a former Chairman of the Peoples Democratic Party, Haliru Bello, to death in Abuja on November 19, 2017. She and and her co-defendants, had through their objection, urged the court to dismiss the two counts instituted against them by the police. They also, in another leg of the application, prayed the court to order the prosecution to provide them with certain exhibits in the custody of the prosecution within 14 days. But Justice Yusuf Halilu, after taking arguments from both the prosecution and the defence, on Monday, deferred his ruling till when judgment is to be delivered in the case. The deferment of the ruling, according to the judge, was in line with the provisions of section 396 of the Administration of Criminal Justice Act. 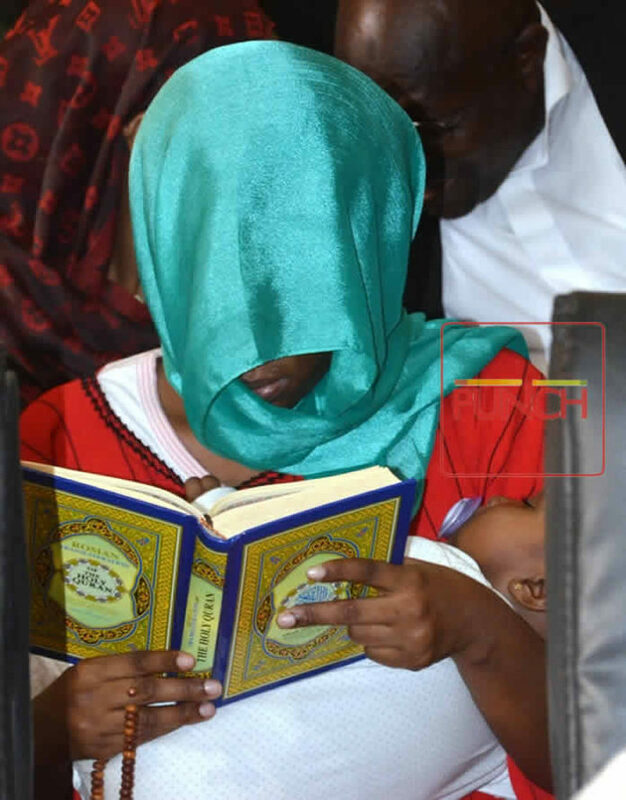 Sanda, pregnant and also nursing a baby of less than a year old, is being prosecuted on two counts, alongside her mother, Maimuna Aliyu; brother, Aliyu Sanda; and their house help, Sadiya Aminu. Sanda, who wore a flowing black robe with a black veil completely covering her face and head, on Monday, made her first appearance in court after she was granted bail and released from Suleja prison in Niger State on March 7, 2018. She was offered a chair on which she sat inside the dock in the middle of the proceedings. But the rest of three defendants who had been granted bail in February this year, remained standing in the dock throughout the proceedings. Through their lawyer, Mr. Joseph Daudu (SAN), the four defendants had filed an objection to the charges, praying the court for among others, an order quashing the charges for being “incompetent, null and void”. Another leg of the application urged the court to furnish or grant them “unhindered access” to all materials relevant to the case. The materials sought by the defendants included “all statements” by the defendants, all the investigation police officers and any other person, in the course of investigating the complaint leading to the charges instituted against the defendants. They also sought to be furnished with the coroner’s report on the death of the deceased. They also asked to be granted access to “original copies of all photographs taken”, weapons, including knife and broken pieces of ceramic plates used in the commission of the alleged offence, for their inspection. Other materials sought to be allowed to access were, a ‘scrap iPhone’, ‘clothes with blood stain’, and ‘Compact Disk ROM’, as referred to by the prosecution in their additional list of evidence. Relying on the provisions of section 376 of the Administration of Criminal Justice Act, the defendants’ lawyer, Daudu, argued on Monday that the charges filed by the police were incompetent as long as they had failed to obtain the opinion of the Attorney-General of the Federation’s office on whether or not the evidence gathered was sufficient to prosecute the case. He insisted that the procedure highlighted in section 376 of ACJA were conditions precedent which the police must follow before the charges could be instituted. He added that such charges could only be initiated by the AGF not the police. According to him, without the procedure being followed, “it means there is no charge”. On the other leg of his client’s application requesting access to some materials in the custody of the police, Daudu said, his clients were entitled to being granted an access to the exhibits in the custody of the police in line with their right under section 36(6)(d) of the Constitution, which provides that all defendants must be given adequate time and facility to defend themselves. Responding, police prosecutor, Mr. James Idachaba, urged the court to dismiss the defendants’ objection but should only deliver ruling on it at the time of delivering judgment in the case. Idachaba argued that the objection to the effect that the charges were incompetent, null and void “is totally misconceived”. According to him, Section 376 of ACJA cited by the defence had to with the criminal proceedings initiated before the Magistrates’ court but which the court lacked jurisdiction to hear the offence charged. On the argument that only the AGF could initiate the charges, Idachaba said the Supreme Court had since ruled that the police could prosecute without recourse to the AGF. He added that the prosecution had complied with section 36 of the Constitution by filing along with the charges and serving same on the defendants, the proof of evidence containing all the materials as prescribed by the law. He also said if they insisted on getting the original copies of the materials they had sought to subject them to “forensic analysis” as they had sought, they had to wait till when the materials would be tendered and admitted as exhibits before the court. He said, “In sum, your lordship, the entire motion and the relief sought by the defendants are totally lacking in merit. In a short ruling, Justice Halilu said the objection was one that could wait for determination at the end of the trial as stipulated in section 396 of ACJA. He ordered the prosecution to immediately call their first witness on Monday. However, Idachaba said, although his two other witnesses were seated in court, the witness whom he intended to call first was earlier in court but could not be found at that moment. In response the judge warned the prosecution to always bring all their witnesses to court and the witneses must not leave the courtroom before adjournment. He said the court would hear the case two times every week. He then adjourned till April 19 and 20. In the amended two counts preferred against the four of them, Maryam was accused in the first count of committing culpable homicide punishable by death under section 221 of the Penal Code Act. The trio’s offence was said to be punishable under section 167 of the Penal Code Act. Abuja, on November 19, 2017, “with the knowledge that his death would be the probable and not only the likely consequence of your act”.